When you save files in Photoshop Elements, you need to pick a file format in the Format drop-down menu found in the Save As dialog box. Whether you can select one format or another when you save a file depends on the color mode, the bit depth, and whether layers are present. If a format isn’t present in the Format drop-down menu when you attempt to save a file, return to one of the edit modes and perform some kind of edit, such as changing a color mode or flattening layers, in order to save the file in your chosen format. For a glimpse at all the file formats available to you, open a standard RGB color image in Edit Full mode, choose File→Save As, and click the down arrow to open the Format drop-down menu. Open the Format drop-down menu in either the Save or Save As dialog box to make the formats supported by Elements appear. Alias PIX (Macintosh): This format was introduced by Wavefront Technologies to import geometric data from ASCII files. BMP (*.BMP, *.RLE, *.DIB): The bitmap format supports saving in all color modes and in all bit depths. Use the bitmap format when you want to add images to system resources, such as wallpaper for your desktop. Bitmap is also used with many different programs. CompuServe GIF (*.GIF): GIF is a popular format for hosting Web graphics. GIF images can be indexed color or animated images, and they support the smallest file sizes. Use this format when you need fewer than 256 colors and want to create animation in your images. Photo Project Format (*.PSE): Use this option when you create a project and want to save the file as a project. Photoshop EPS (*.EPS): Photoshop EPS (Encapsulated PostScript) files are sometimes used by graphic artists when they’re designing jobs for commercial printing. IFF (Macintosh): A generic file format introduced by Electronic Arts to ease transfer of data between software produced by different companies. JPEG (*.JPG, *.JPEG, *.JPE): JPEG (Joint Photographic Experts Group) is perhaps the most common file format now in use. JPEG files are used with e-mail attachments and by many photo labs for printing files, and they can be viewed in JPEG viewers and directly in Web browsers. 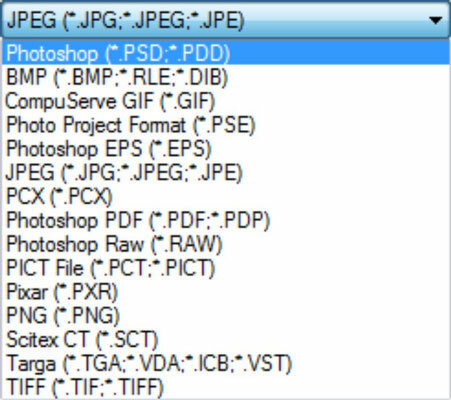 Just about every program capable of importing images supports the JPEG format. PCX (*.PCX): PCX is a native PC format first used with PC Paintbrush. Most programs now support newer file formats, and you’re not likely to need to save in PCX format. If you have legacy files from years ago, you can open PCX files in Elements, edit them, and save them in a newer format. Photoshop PDF (*.PDF, *.PDP): Adobe PDF (Portable Document Format) is designed to maintain document integrity and exchange files between computers. PDF is one of the most popular formats and can be viewed in the free Adobe Reader program available for installation on your Elements CD installer or by downloading it from the Adobe Web site. Photoshop Raw (*.RAW): This format is used to exchange files between Windows and Mac users and mainframe computers. Unless you prepare files to be viewed on mainframes, don’t bother saving in this format. Pixar (*.PXR): This format is used for exchanging files with Pixar workstations. PNG (*.PNG): PNG (Portable Network Graphics) is another format used with Web pages. PNG supports all color modes, 24-bit images, and transparency. Some older browsers, however, may need a plug-in to see PNG files on Web pages. PNG uses lossless compression, resulting in images without degradation. Scitex CT (*.SCT): The Scitex Continuous Tone (CT) format is used by Scitex workstations in commercial printing environments. Targa (*.TGA, *.VDA, *.ICB, *.VST): Targa is a format for describing bitmap images and is capable of representing bitmaps from black and white, indexed color, and RGB color. It’s used for applications that can read Targa files, such as Truevision’s hardware. TIFF (*.TIF, *.TIFF): TIFF (Tagged Image File Format) is the most common format used by graphic designers. TIFF is generally used for importing images in professional layout programs, such as Adobe InDesign and Adobe PageMaker, and when commercial photo labs and print shops use equipment that supports downloading TIFF files directly to their devices.